In this issue, we’ll look at the late-blooming towns in the Brown County area that sprang up along or near the growing railroad. All but a few have faded into history. By the summer of 1881, the Chicago and Northwestern Railroad was moving into what is now Brown County. That same summer, the town of Ordway was platted. 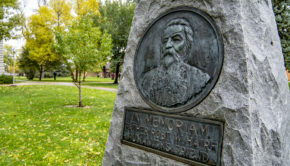 At this time the area was still known as Dakota Territory (both North and South Dakota), and the territorial governor was Nehemiah G. Ordway. The town was named after him for a good reason. The territorial capital had not yet been named, and because of its central location, Ordway became a candidate for the capital. The town became a farming center, and because of the possibility of it becoming the capital, the Methodist Church decided to build a university there. It became a boom town and grew rapidly as settlers flocked to the area. In short order it had a general store, lumberyard, physician, two hotels, a lawyer, drug store, two elevators, and a blacksmith shop. Hopes were high and the future seemed bright. In 1883 things changed rather drastically. 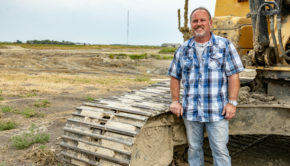 By building on the rail line, Ordway was counting on becoming an economic hub. But when the railroad extended the line to Columbia, Ordway lost its economic advantage. In this same year, Bismarck was chosen as the territorial capital. On the heels of those two events, the construction of the Methodist university was abandoned, and in 1885 it was decided that the university would be built in Mitchell instead. Ordway no longer exists. Hamlin Garland’s father operated the general store in Ordway and also farmed in the area. The road between Highway 281 and the city of Columbia is named after him. In 1882, settlers from Michigan moved into what is now Brown County and founded this settlement in anticipation of the Milwaukee Railroad coming through from Groton. It was originally named Foxton. A post office was established on October 24, 1882. Foxton continued to slowly grow, and in 1889 the town was moved to the David Huff homestead and renamed Huffton. At the peak of its growth, the town had two elevators, a post office, general store, school, church, and several residences. Over the years the church steeple was removed as the congregation consolidated with another church, and the building became the town hall until it was eventually torn down. In the 1960s, the two elevators were sold to area farmers for storage, and Huffton drifted off into history. Detroit was established in 1883 after a post office was commissioned on April 24 of that same year. The developers of Detroit were betting on a rail line coming through from Groton. The town grew very fast. 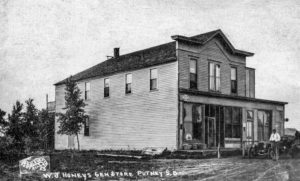 A general store and a one-story hotel that contained offices, a dining hall, and rooms in the back were built. Shortly thereafter, lumber was obtained from Columbia and a church was built and named Father Hedger Methodist Church, honoring him as the father of his two sons who were promoting the town along with others. The official plat of this town was not officially filed until May 8, 1884. As soon as this was completed, a town hall, school, blacksmith shop, and drug store were established. The town began publishing a newspaper, the Detroit Free Press, which was printed in Columbia. As the town grew, the only way to get to Detroit was a prairie road that followed the stakes for the proposed rail line from Groton. As fast as this town was growing, its demise was even faster. In 1886, the St. Paul-Minneapolis-Manitoba Railroad built a line from present-day North Dakota to Aberdeen seven miles southeast of Detroit where the town of Claremont was platted. 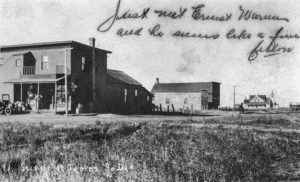 In addition, as the Chicago and Northwestern Rail Line expanded, the town of Hecla was established. With no rail line and no road access, the town dissolved and buildings moved. The general store was moved to Claremont, the church moved two miles north of Claremont, and the blacksmith shop, hotel, and dance hall were all moved to area farms. Detroit was gone as quickly as it came. Randolph was platted along the Minneapolis and St. Louis Rail Line in the southern part of the county in 1908. The town served a large area before road and highway improvements allowed people to travel easily. During its heyday, Randolph had a general store, bank, hardware store, church, school, post office, barbershop, and five elevators. The town, like all small towns, declined greatly during the Dirty Thirties. The post office and general store operated until 1953. The hard times of 1883-1886 took a toll on early settlements due to poor crops and drought. By the end of 1886, things were looking better due to improved harvests, so the railroads continued their expansion. The Chicago and Northwestern Railroad extended their lines, and the construction of the incoming Great Northern and Minneapolis and St. Louis Lines reinvigorated the establishment of towns. In 1887, the town of Putney was platted along the rail line. The settlers were from New England and named the town after Putney, Vermont. Rather quickly, a hotel, two grocery stores, a general store, blacksmith shop, drug store, and dance hall were all open for business. For a few months in 1887, they published a paper called The Putney Messenger. Shortly after 1900, a service station and two elevators were built. Over the years the town dispersed, although a general store did operate until the 1970s. The dance hall was purchased by John Sieh and moved to the Granary Rural Cultural Center, where it has been restored and is used for events held by the Dacotah Prairie Museum. Welsh settlers from Wisconsin established Plana in 1887. It was originally named Hadley, but was then changed to Plana. A post office was commissioned in August 1887. Soon a train depot was built, followed by a school, church, community hall, barber shop, general store, three elevators, and several homes. Since its establishment, the town has disappeared. Fife was located seven miles west of Aberdeen along the Milwaukee Road Rail Line on a side track on the Yoder farmstead. J.G. 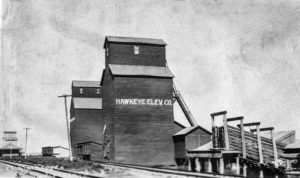 Brady built an elevator capable of handling 25,000 bushels of grain at a time. The elevator operated under Brady until 1927, when it was bought by Wheat Growers. J.W. Ziegler, a well-known elevator man and farmer from the Fife area, would manage it. Difficult financial times led to the closing of the Fife elevator. James was originally named Chedi after the lake that had been constructed on the James River near Columbia. In January 1889, a post office was commissioned. A depot was built at that same time, along with a lumberyard, hotel, café, church, parochial school, poolroom, general store, jail, three elevators, and several homes. In March 1896, the town name was changed to James in honor of F.D. James, who owned the southeast quarter being subdivided for the town. F.D. James was the brother of Tom James, who settled in the Tacoma Park area. People flocked from miles around to enjoy a touch of spirits. In fact, they sold their own brand of liquor that was labeled “Bottled for the Ladner Bros., James, SD., 1897.” Because of this, the saloon drew a fair number of rambunctious transients. After becoming intoxicated and rowdy, they were jailed in the town jail. However, the jail doors were “magically” opened prior to when the next scheduled freight train was due. It solved the problem. The general store operated until it burned down in 1927. It was not rebuilt because by that time the town’s population had dropped to 10. Today, there are just a few homes left in James. Stratford was platted in October 1906 along the last rail line to be built, the Minneapolis and St. Louis. Founders wanted to name it Rondell after the first early settlement in the area, but the railroad chose Stratford. Within weeks of it being platted, the town sprang up. Lumber and supplies for construction were hauled in from Aberdeen and Ferney. The first building up was the Stratford Mercantile Company. 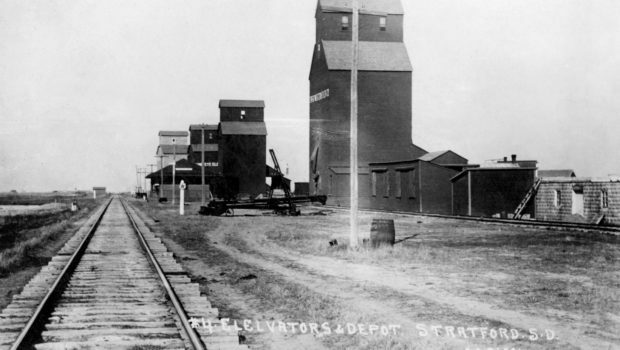 It took two years for the railroad to finally reach Stratford in 1908, but when it did there were four elevators almost full of grain waiting for shipment. That same year, passenger trains were taking people from Stratford to Watertown and back for $2.15 per trip. 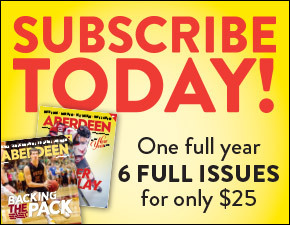 Two trains were running daily through Aberdeen, carrying up to one 100 passengers every day. By 1909 there were two banks, three restaurants, two dray and transfer companies, two blacksmith shops, two hardware and harness dealers, two physicians, a drug store, newspaper, poolroom, barber and bath, furniture store, farm implement dealership, confectionery, flour and feed mill, shoe store, insurance agency, real estate office, lumberyard, meat market, and a milliner’s shop. By 1911, it reached its peak population of 600. Also in 1911, an artesian well began furnishing the residents with water, with water lines put in shortly thereafter. A cement factory was started and operated into the late 1920s. Pete The Butcher had the second walk-in cooler in the state, managed a smokehouse, and became famous for his homemade sausage, ham, and liverwurst. He hauled wagon loads of meat to Aberdeen on a regular basis. He also won a national carcass skinning contest in Chicago hosted by Swift & Company. Fires during the early 1920s, the stock market crash in 1929, and severe drought conditions caused by the Dirty Thirties all took a toll on the town. Today, Stratford is still going as a nice small, quiet community. Richmond was platted along the Minneapolis and St. Louis Rail Line northwest of Aberdeen on March 19, 1907. 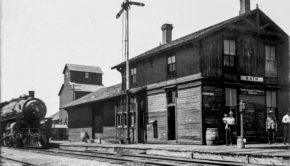 A depot, grain elevator, stockyard, lumberyard, store, and house for a freight agent were built. A post office opened in April 1909. By 1909, there were 144 residents. In 1913, the post office moved to Wetonka, and in 1926, the depot moved to Long Lake. The Dirty Thirties ended the town, although a grain elevator did operate until 1967. It was located by what is Richmond Lake today. Barnard was the last town to have a post office commissioned in 1910. In 1911, the town was platted. 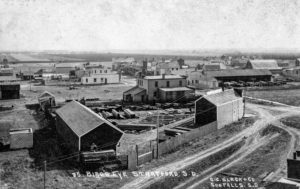 In 1915, the population was only 18, but the town already had a general store, bank, lawyer, feed mill, grain dealership, and blacksmith. By 1920, the population increased to 50 and stayed there until 1925. During this five-year period, land prices were climbing and crop prices were good. 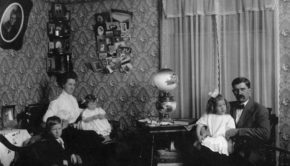 The drought of 1926, along with the stock market crash of 1929 and the Dirty Thirties, spelled disaster for this bonded community. A few people still call this Barnard home.